The headlines sound promising: The entire Senate Foreign Relations Committee, Republicans and Democrats, has asked the State Department to explain what went wrong before, during and after the 9/11/12 attack on the US Consulate in Benghazi, during which the US ambassador Christopher Stevens and three other Americans were killed. But there's a catch. The bi-partisan letter that went out on September 27 says: "It would be very helpful to us if we could receive responses and a briefing on these matters during the week of November 13th when the Senate is expected to go back into session." What's that they say about a cartoon being worth 884 words? Iran’s Ahmadinejad? Egypt’s Morsi? Some little-known, fatwa-flinging cleric increasing the bounty on Salman Rushdie’s head? None of the above. The words are President Obama’s, and he spoke them this week to the U.N. General Assembly. No Big Media outlet reported this stunning pronouncement. It’s as if Ronald Reagan addressed the National Association of Evangelicals in 1983 and the media failed to report that he used the phrase “evil empire.” To make the comparison more direct, imagine if a Republican president declared that “the future must not belong to those who slander the messiah of Christianity” – or, for that matter, the prophet of Latter-day Saints. We would have heard all about it, and for the rest of our lives. "Not even high intelligence and a senstive spirit are of any help once the facts of a situation are deduced from a political theory and not vice versa." In a national security context, this is called politicizing the intelligence -- making the facts fit a political narrative rather than allowing the facts to construct a narrative of their own. Our motto is taken from Thomas Jefferson: Freedom of the press cannot be limited without being lost. "Now Playing in Washington: More Lies from Tariq Ramadan"
All you need to know about the about Mona Eltahawy (with spray can) is that she describes herself as "a liberal, secular Muslim" -- except when it comes to free speech. On Wednesday the 26th and Thursday the 27th at 8pm, Glenn Beck's The Blaze TV will debut a two-part documentary, The Project, which I've had the privilege of participating in with an all-star cast, including: Michele Bachmann, Stephen Coughlin, M. Stanton Evans, Louie Gohmert, Sebastian Gorka, John Guandolo, Andrew C. McCarthy, Patrick Poole, and Erick Stackelbeck. Below watch two individuals -- one a NY state senator, one an Israeli UN ambassador -- stand up and walk out on enemies of civilization. Both men are both to be commended. But what about the rest who remained? Army chief of staff Odierno's so-called response to SSG Sitton's letter is below. LARGO — Cheryl Sitton's questions are simple. To her, the answers should be, too. And so far, she's not satisfied with what top U.S. military officials have explained in the wake of the death of her son, U.S. Army Staff Sgt. Matthew Sitton. So she'd like the chance to talk to them in person. On June 4, Matthew Sitton wrote a letter to U.S. Rep. C.W. Bill Young. In it, Sitton asked for help. For months, he wrote, his platoon had been mandated to patrol empty fields and compounds littered with explosives. His objections, and requests for an explanation, were disregarded. He was told to quit complaining. About two months after writing that email, Sitton stepped on an explosive and died. He was 26. Michelle Malkin and Ilana Mercer have ripped David Brooks and Peggy Noonan for either slobbering over Obama or raking Mitt Romney, both along MSM lines, all the while impersonating or assuming a conservative guise. Something to take into consideration, too, is the heavily oracular voice, particularly notable on Noonan's part. Well, how did PN's reading of the fiery signs and entrails fare last time around? Rep. Walter Jones: "No More Should Die for a Lost Cause Like Afghanstan"
An Army team carries the transfer case containing the remains of Army Staff Sgt. Matthew S. Sitton of Largo, Fla., upon arrival at Dover Air Force Base, Del., on August 4, 2012. Rep. Walter Jones (R-NC) joins Rep. C.W. "Bill" Jones (R-FL) in calling for a withdrawal of troops from Afghanistan before the 2014 deadline. Mr. JONES. Mr. Speaker, today I had the privilege and honor to visit Walter Reed Hospital to say thank you to our wounded from Afghanistan and Iraq, and I saw those who have lost both arms and legs. It’s just so sad to go there. Cartoons of Muhammad in the satirical French weekly Charlie Hebdo didn’t send France into lockdown. Their publication this week was a simple exercise in free speech on Islam, which Muslims in France and everywhere else in the world oppose as a violation of Islamic law (Shariah). It is Islamic rage over the fact that Islamic law is not dominant everywhere, all the time – Muslims’ signal weapon against a timid West – that drove French authorities to take security precautions, not the publication of cartoons. What's wrong with the following statement? Charlie Hebdo, the satirical French weekly, published a page of Mohammed cartoons today, sending France into lockdown. "They're Killing Us Because We're Infidels"
AP Photo: Lance Cpl. Greg Buckley Jr.'s father Greg, foreground, and mother Marina are escorted from St. Agnes Cathedral after his funeral Mass, Saturday, Aug. 18, 2012, in Rockville Center, N.Y.. Buckley Jr. was barely 21 years old when he was killed in an attack by a policeman in Afghanistan. Paul Sperry rakes the Pentagon response to jihad inside the wire -- more "sensitivity" training -- in the New York Post this week (must have been Prince Talal's day off). Top officials believe culturally offensive behavior is the motivation behind the killings, so it’s stepped up Islamic sensitivity training for our troops. In this address (click "Read More" if you don't see it), the excellent Rep. Michele Bachmann (R-MI) makes the crucial, overlooked connections between Islamic sharia speech restrictions -- as systemically promoted by the Islamic bloc countries of the OIC and the Obama administration -- and how the violence across the Middle East this week fits into the OIC-Obama-Clinton strategy to enforce sharia speech restrictions even on Americans, despite our First Amendment rights. 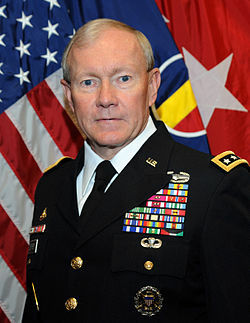 Joseph E. Schmitz (above), former Inspector General of the Pentagon and fellow Team B II co-author of Shariah: The Threat to America, elevates our way of thinking about the divide between Barack Obama and Mitt Romney regarding the essentially American principle of free speech codified in the First Amendment. Who Is Ansur al Sharia? Ansur al Sharia (Guardians of Sharia) is believed to have been involved in the military assault on the US consulate in Benghazi on 9/11 that killed four Americans including Ambassador Christtopher Steven. The Iranian government Press TV video shows a (very) armed demonstration in Benghazi in early June 2012 by Ansur al Sharia to demand a sharia state. As the correspondent sums up: "Libyan Islamic groups who played a major role in the revolution that unseated dictator Muamar Qaddafi were severely repressed under his rule. They believe that the revolution was started as part of the jihad against God's enemies and that process is ongoing until the country is totally and utterly liberated from non-Islamic values." A decent summary of the scene, despite the source. Why can't John McCain get it through his head? Two historic attacks on U.S. territory marked the 11th anniversary of the 9/11 attacks – and what happened? The Obama administration surrendered our constitutional principles. The first was a “blasphemy” riot that breached the walls of the U.S. Embassy in Cairo, whereupon thugs burned the American flag and hoisted in its place the traditional black flag of Islam that flies over al-Qaida and other jihad movements. From a joint statement by Sens. Graham, Lieberman and McCain on the burning of the US consulate in Benghazi and murders of the US ambassador and three staffers. “Yesterday's attack is a tragic and terrible reminder that – despite the hopes of the Arab Spring – the forces of violent extremism in the Middle East are far from defeated, and that the revolutions inspired by millions of people who dream of freedom and democracy can still be hijacked by small groups of violent extremists who are eager to kill to advance their evil ideology." The main "hope" on the part of Tweedles Dum, Dum and Dee is that there in fact exist "millions of people" who dream of freedom -- not "huriyya" -- and democracy -- not sharia -- in the Middle East. What Will Libya Do About "Rogue" Brigade's Act of War? The late Ambassador Christopher Stevens was the US point man with the "rebels" in Benghazi -- the jihadists of the Libyan Islamic Fighting Group and other "flickers" of al Qaeda in Libya. Multiple reports are now attributing the attack on Benghazi consulate attack that killed the US ambassador, one staffer and, I have also read, two Marines to a group called Ansar al-Sharia, a "brigade" identified with al Qaeda as well. The Clintons with racehorse owner and Saudi Prince Ahmed bin Salman bin Abdulaziz, one of the three Saudi princes featured in Walid Shoebat's report (below) who were thought to be financiers of 9/11, and who died within days of each other in 2002. Walid Shoebat's absolutely must-read report on the drastic omissions in the 9/11 Commission's report breaks new ground with the story of the three Saudi princes named by Abu Zubaydah under interrogation who all met unlikely ends within days of each other in 2002 -- as though in response to US private pressure on the Saudis to take care of the 9/11 "problem" themselves. But that's just the sickening beginning. Reuters photo and caption: "Protesters attempt to raise a Salafist flag with Arabic words that read, "There is no God but Allah and Mohammad is his prophet" after pulling down an American flag at the U.S. embassy in Cairo September 11, 2012. Egyptian protesters scaled the walls of the U.S. embassy in Cairo on Tuesday and some pulled down the American flag during a protest over what they said was a film being produced in the United States that was insulting to the Prophet Mohammad, witnesses said." Why Did George W. Bush Ignore Multiple Warnings of an Al Qaeda Strike? Kurt Eichenwald examines recently declassified documents regarding multiple warnings President Bush received prior to 9/11 and comes to an "inescapable conclusion," as he writes in today's New York Times. "The administration’s reaction to what Mr. Bush was told in the weeks before that infamous briefing reflected significantly more negligence than has been disclosed." The article does more than assert: "The analyses presented below reveal without a doubt that the Long-Form Birth Certificate of Mr. Obama is a fabricated, fake and forged document." Election 2012: Citizen or Subject? Back in 2008, during the peak illusory powers of Barack Obama as the post-partisan hopester-and-changer, the media consistently failed to report that the statist beliefs of the Democratic presidential nominee came straight from the socialist playbook. In many cases, the media probably didn’t realize it themselves. At the same time, though, there was, and is, a feeling that such labeling is taboo. Even after an October surprise, a question from “Joe the Plumber,” prompted candidate Obama to reveal his inner redistributionist – “I think when you spread the wealth around, it’s good for everybody,” Obama told “Joe” in 2008 – the S-word was verboten. No "Discernable Pattern" to Islamic Murders of Western Troops: Really? LTG James Terry:"The closer you are in terms of relationship and friendship with the Afghan partners, the safer you are." Ok, general. You go first. WASHINGTON – The United States will help the Afghan government recheck the entire 352,000-member Afghan security force in the wake of an upsurge of attacks against international troops by Afghans in uniform, the No. 2 U.S. general in the country said Wednesday. “We’re going back through, along with our partners up here at [the Afghan interior and defense ministries,] a lot of information out there to try to pull together patterns,” said Lt. Gen. James Terry, commander of ISAF Joint Command. About Afghanistan. With President Obama shifting rhetorically and Candidate Romney remaining silent or resorting to platitudes, the so-called "good" so-called "war on terror" in the Islamic Republic of Afghanistan is the political orphan of the 2012 campaign. Sniping over withdrawal dates is no substitute for grown-up discussion of the utterly and completely failed COIN strategy of nation-building on the backs of the US military, of strapping leftist, Kum-bay-a theories of "world peace" to the body armor of Americans and Australians and Brits and the rest, and sending them out into the IED-mined field of jihad. Really get to the know the people, said their commanders. Take off those ballistic glasses, and protect them from everything that can hurt them, said the generals. And dump hundreds of millions of dollars down the drain while you're at it. For last week's column on the hypocritical "white" media, I chose Brian Williams as my poster-child illustration. Just as apt a choice for Top "Whiteness" Media Hypocrite (if not miles and miles better, as this WND story below demonstrates) is the always undelectable Chris Matthews. Matthews says he’s also troubled by racially polarized neighborhoods. Matthews ought to know. He and his wife live in a predominantly white zip code in the leafy and affluent suburbs of Chevy Chase, Md. Just 5 percent of his neighbors are black, according to U.S. Census Bureau data. His million-dollar home [DW: likely "multi"-million] is nowhere near the “ghettos” where Matthews, the self-anointed, prime-time champion of racial equality, suggests more whites need to live.